We recommend evaluative voting methods, where voters rate candidates independently on a scale. There are two basic kinds of evaluative methods, depending on the type of scale: scored methods, where the scale is numeric (e.g. 0 to 5), and graded methods, where the scale is set of named grades (e.g. Dislike, Neutral, and Like). Scores are summed, while grades are counted. These modern voting methods arose a couple of decades ago along with surveys (on Likert scales) and five-star or binary “like” rating on the Internet. Voters are familiar with giving ratings in surveys, but rating also has a strong theoretical basis for voting. Evaluative voting methods are generally better and simpler than the older voting methods, which are based on ranking candidates or giving them voting tokens. There is no single best voting method—the right method depends on the group and the decision—but evaluative voting methods that we like include Score Voting, Approval Voting, STAR Voting, and 3-2-1 Voting. The table below provides a summary, but you can read about them in more detail at Electowiki.org. Voting methods can use a variety of expression tools. The word “ballot” comes from the Italian word for “little ball”, “ostracize” from the Greek word for “pottery shard”, and psephology (election science) from the Greek word for pebble—all of these voting tokens could be dropped in an urn. Some voting methods can use a show of hands, or have you literally stand by your candidate (e.g. in a caucus). Some implementations might have clever interfaces on a computer screen, e.g. drag and drop. Most voting methods—and all of those commonly promoted—can use a grid layout. 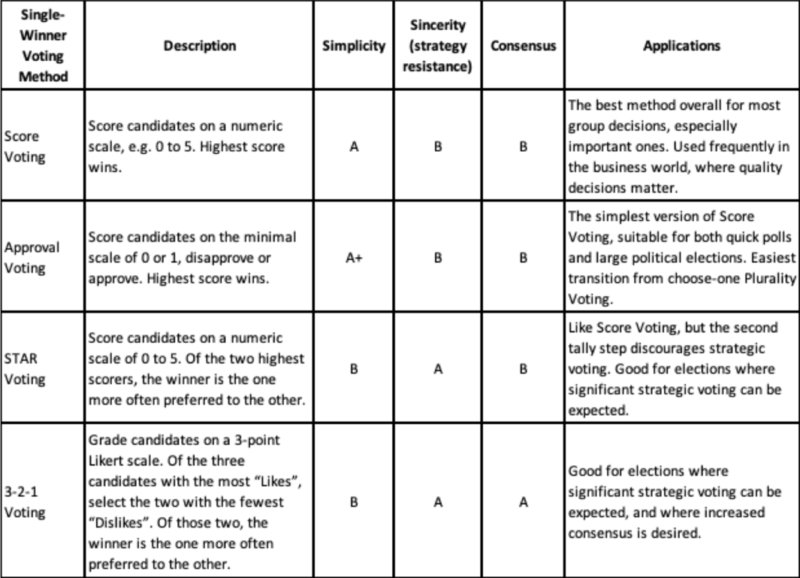 Candidates’ names are listed in the first column, next to which are two or more columns of bubbles representing a rating (or a ranking in some voting methods). We suggest promoting this common ballot format separately from any particular voting method. However, evaluative voting methods, especially Approval Voting, can use the linear design common in today’s ballots.